What response of skin blood flow in hindlimb does electrical stimulation of forelimb induce? The nervous system includes the central nervous system (CNS) and autonomic nervous system (ANS). Abundant evidence exists to show that structures and functions of the CNS in humans are bilaterally asymmetrical. The best known example of brain laterality is that the language center is located in the left hemisphere of the human brain. In contrast, few studies have investigated functional asymmetry of the ANS. The sympathetic nervous system (SNS) of the ANS is responsible for the control of blood flow in the body. However, whether bilateral differences in responses exist in skin blood flow (SBF) regulated by the SNS is unclear. Fig. 1. Schematic drawings of the methodology for application of electrical stimulation to the forelimb and measurement of skin blood flow to the hindlimbs. In panel A, rats were randomly divided into four experimental groups, with electrical stimulation of either 3 Hz or 125 Hz applied to either the left or right forelimb. In panel B, skin blood flow was measured in both the left and right hindlimbs. It is well known that 1) neural circuits that control a limb can be affected by a simple contraction of one muscle group in other limbs, and 2) there is a functional interaction between the upper and lower extremity. Electrical stimulation (ES) of the body surface can affect the blood flow in the skin and various organs such as the uterus, kidney, brain and heart. To determine whether the ES of the forelimb influences the SBF of hindlimbs, we conducted a study in rats. Since the general response to ES is more obvious under pathological than physiological (uninjured) conditions, we induced ischemia of bilateral hindlimbs via tourniquet application in rats. A number of previous studies have shown that ES at different frequencies has differential effects on ovarian blood flow, pain response and ankle edema. Therefore, we applied different ES frequencies of either 3 or 125 Hz to either the left or right forelimb in rats in our study. We investigated 30 rats randomly divided into five groups: one control group and four experimental groups according to the site and frequency of ES: the R125 group and L125 group received ES at the right and left forelimb at 125 Hz, respectively. 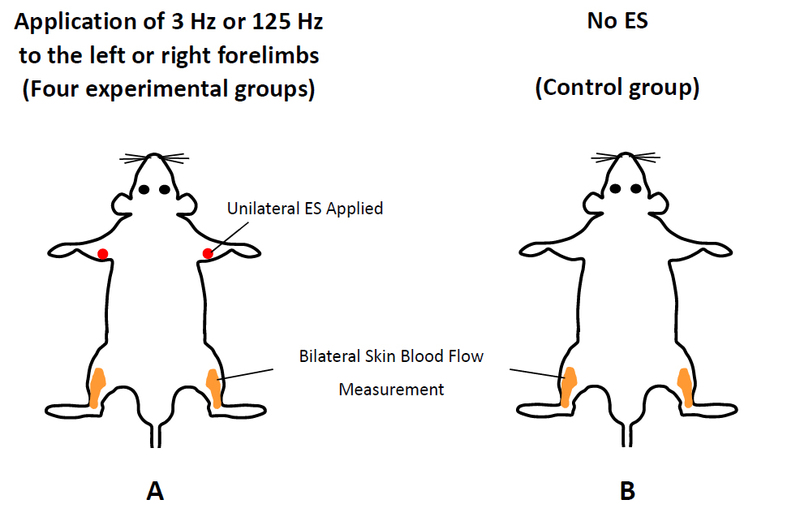 The R3 group and L3 group received ES at the right and left forelimb at 3 Hz, respectively (Fig. 1A). The control group received no ES (Fig. 1B). Two stainless-steel needles were inserted into the triceps muscle of either the left or right forelimb at a depth of approximately 5 mm and then connected to an electrical stimulator. During the ES procedure, blood flow in the skin of the lateral part of the biceps muscle of both hindlimbs was measured using a laser Doppler scanner. In our study, we found that application of 125-Hz ES to the right forelimb (R125) led to a rapid increase in SBF in the right hindlimb within 3 min, and showed significantly higher levels of SBF in the right hindlimb compared to the control group. However, there were no significant differences in SBF in the left hindlimb between R125 and control groups. In contrast, the same ES that was applied to the left forelimb in L125 group had no effect on SBF in either hindlimb. No changes in SBF were seen in either hindlimb when ES was applied to the left or right forelimb at 3 Hz (Fig. 2). Fig. 2. Results. Following ES of 125 Hz to the right forelimb, SBF increased significantly in the right hindlimb compared to the control group. In contrast, no significant differences in SBF were seen between the L3, R3, or L125 experimental groups after ES compared to the control group. These findings indicate that unilateral ES of the forelimb induced an asymmetrical SBF response in hindlimb, and that ES-induced enhancement in SBF in the ischemic hindlimb was frequency-dependent. In addition, these results suggest that a certain area in the forelimb is functionally correlated with a specific area of the ipsilateral hindlimb. Therefore, the physiological function of a specific area in the hindlimb may be influenced by the stimulation of a specific area of the ipsilateral forelimb. We can use such reciprocal interactions between these two functionally correlated areas of the body to develop novel and effective therapeutic methods for clinical usage. Asymmetrical responses of skin blood flow in ischemic hindlimbs to electrical stimulation of the unilateral forelimb.